As the new year reigns in many of us take time to reflect on the previous year. 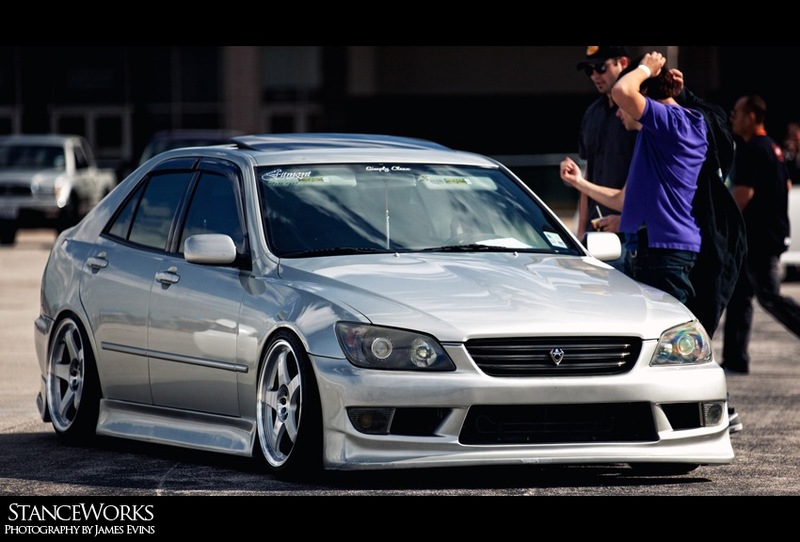 If you're a grassroots drifter in the state of Texas then 2010 has treated you well. There have been over 20 drift events thrown this year, thousands and thousands of dollars in prize money given out, and an ever increasing amount of participants and spectators at events. Many of the drift events have been thrown in collaboration with car shows to bring out an interesting blend of Texan automotive culture. It sure has been exciting, and we have Aaron Losey of Fabricated Motorsports to thank for hosting such incredible events. While 2010 was definitely a spectacular year, you can expect 2011 to be even better! 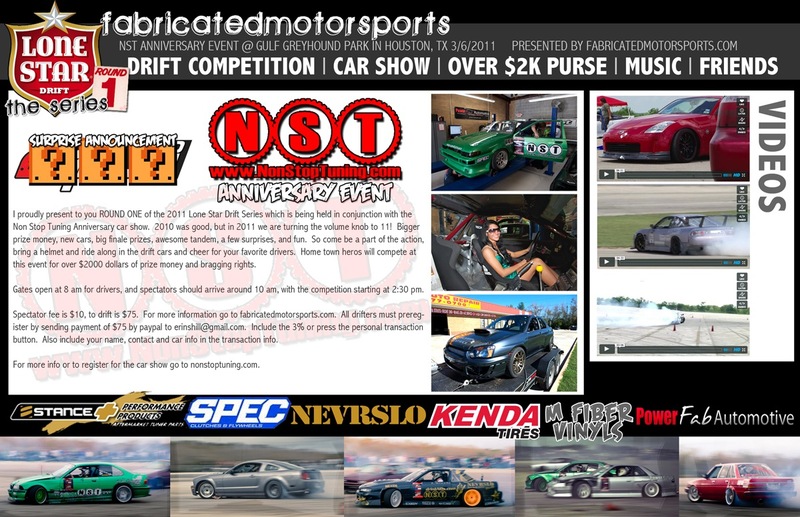 Aaron has announced that Fabricated Motorsports will be hosting Lone Star Drift: "The Series" - a points series consisting of up to six events through the year. You can expect to see bigger events, more prize money, and even more aggressive driving as the best drivers in Texas compete for the series championship! I was invited to attend a "dial in" session at a PowerFab Auto, a local performance shop here in Houston, Texas. The goal was to put together a spec sheet for all the drivers in 2011. Power figures were generated on the dyno, the cars were weighed, and steering angles were measured and compared. While some cars have yet to debut for the 2011 season, the majority of these cars and drivers will be competing next year. I also attended the following drift event and car show hosted in collaboration with Imported Performance. Will Parsons was one of the first cars to make a run on the dyno with his NST Green Toyota Corolla. This car competed heavily in XDC last year with three other NST drivers - Aaron Losey and XDC Champion Chelsea Denofa. Will's car put down 298 horsepower to the wheels - not bad for a 4AGE! Obviously, the car is turbocharged. While this Miata may have only put down 149 horsepower to the wheels, you have to remember that it still weighs in at under 2200 pounds. A good driver doesn't need to put down massive amounts of power to be competitive. 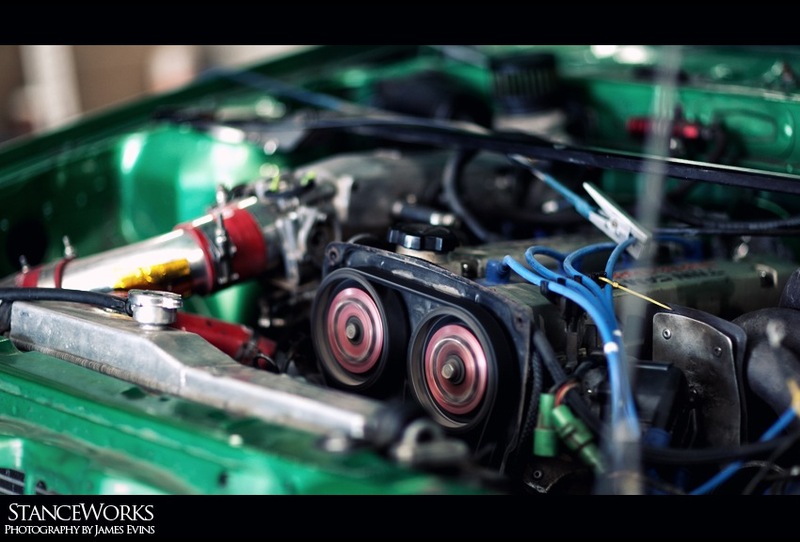 Stew Leask managed to put down around 400 horsepower in his LS1 powered S13. 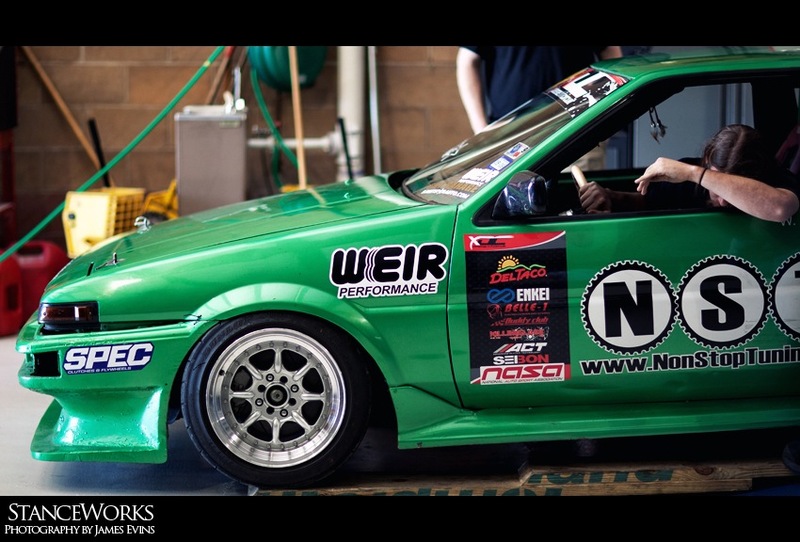 This car is sponsored by PowerFab and they attend track days regularly to provide Stew with maintenance and assistance. Brad Burnett can be seen here lowering his Corolla onto the scales. This car barely tipped the scales at just over 2300 lbs - not bad for a car pushed around by a Toyota 1UZ-FE V8! Stew Leask prepares to dial in his steering angle and weight while Chelsea Denofa runs his BMW M3 on the dyno. Later that day, Robert Turnbow showed up in his MX73 Toyota Cressida.... surprisingly, with a new coat of paint and a set of Work Euroline SLs! This car was originally a drift missle, but with the added touches the car was quite the head turner. I ended up catching this quick shot of the guys from Mayday Garage shooting the car while chatting it up with Robert. After that, I called it quits for the day and headed home, only to get up at 7:00 AM the next day to make my way down to the drift event! Once I arrived at the event I noticed a very impressive turnout of spectators and show participants. I love that the events aren't always just drift cars - plenty of street builds and stanced cars are usually in attendance. This car is owned by a guy named Easton who drove all the way from Louisiana! This is probably the most pristine NSX I've ever encountered. The car is absolutely mint - looks like it just drove off the showroom floor! 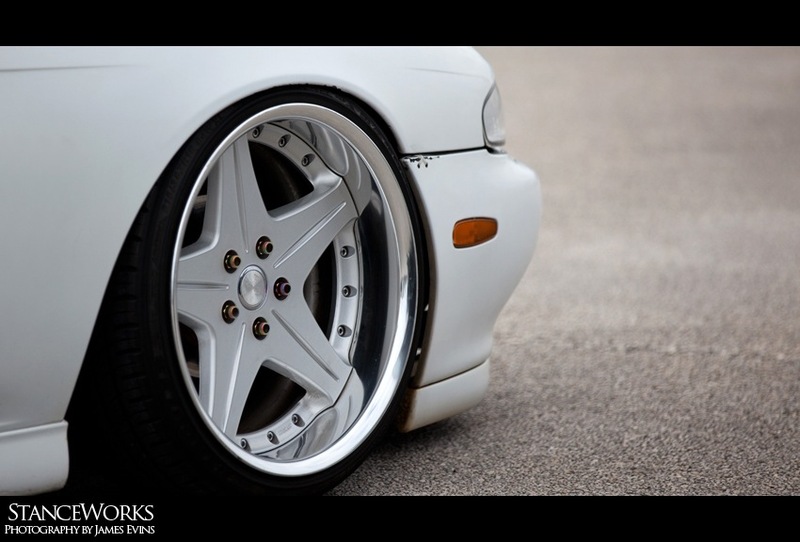 The modifications are also tasteful and subtle and flow well with the factory lines of the NSX. As always, there are plenty of Civics in attendance - this one definitely was interesting enough to stand out from the rest. This Audi from Team 16Niss showed up for the show - these guys are very well known in Texas for having some of the most tastefully done show cars. I was told this car is only in the beginning stages and to look out for it in 2011! Work Euroline SLs are timeless - they look good on anything! 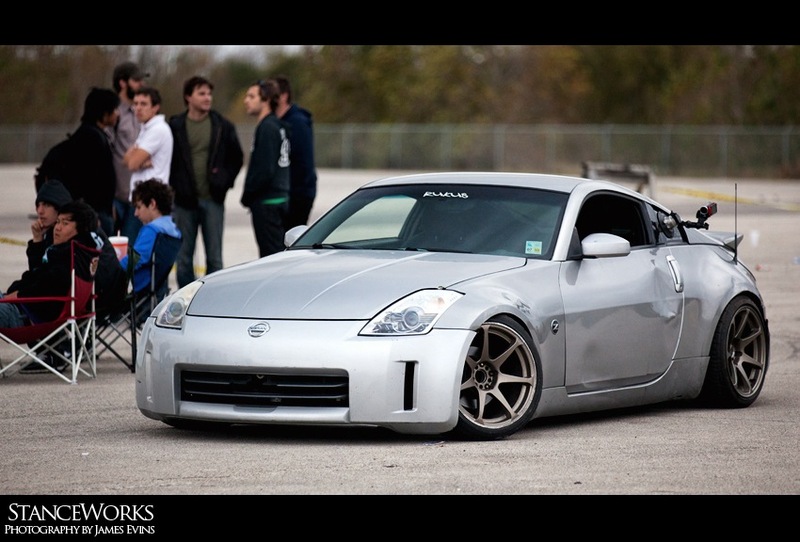 ... as demonstrated by this 350Z! The battle damage is an obvious testament to how hard this car gets driven. Absolutely classic! 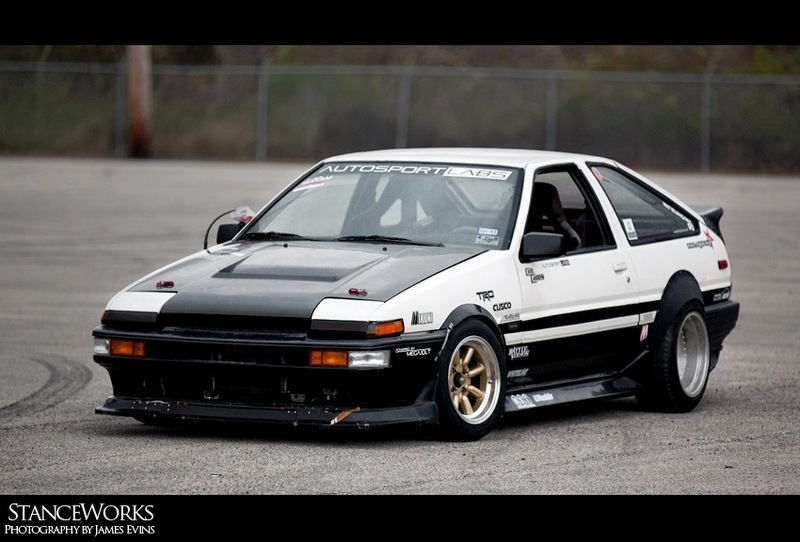 This could possibly be the best looking AE86 I've come across in Texas. 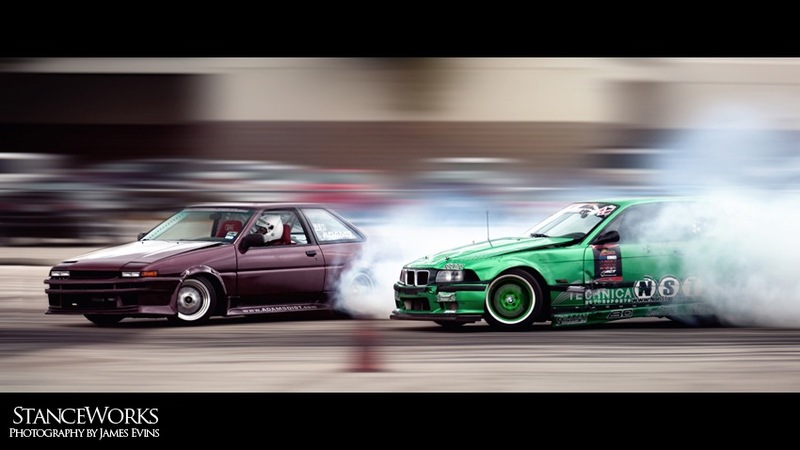 Brad Burnett's in the Corolla battles it out with Chelsea Denofa in the M3... both of these cars laying down serious smoke in the process! 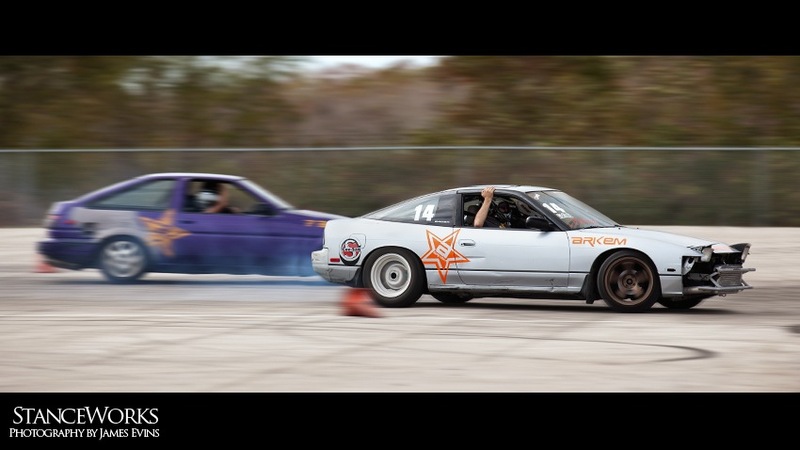 Josh Steele maneuvers his way through a high speed drift in his 240SX. Stew Leask laying down the smoke screen - this guy is an excellent driver as well as a crowd favorite. I believe next year he will be running XDC in this S13 and driving another 240SX in the Texas series. Brad Burnett again, powering through a long sweeper in his 1UZ-FE powered Corolla. 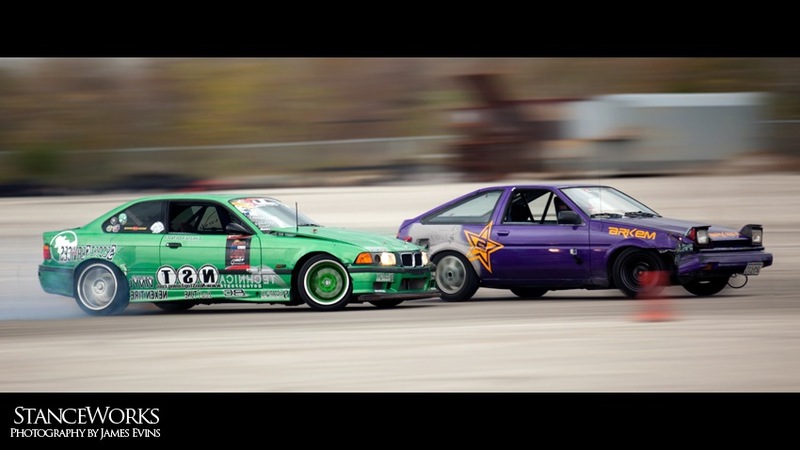 Here, Chelsea Denofa in the M3 battles Robert Lee in his AE86 for first place! Chelsea ended up winning the event, but Robert's second place finish was very impressive - the car only puts down 111 horsepower at the wheels! I'll go ahead and wrap this up with a flyer from the first event for 2011! If you guys are located in the Texas area then don't hesitate to come out!